Verbena hastata is a tall plant reaching over 6 feet in height. The alternate leaves are dentate. The multiple flowering spikes are dense with overlapping purple flowers. The fruit consists of four nutlets in a persistant calyx. With the large numbers of flowers per flower spike, a very large number of nutlets is produced. 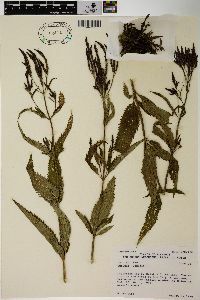 Compared to Verbena macdougalii, a very similar species, the flower spikes of Verbena hastata are much slimmer and the stem hairs of V. hastata are appressed to ascending compared to the spreading stem hairs of V. macdougalii. Verbena hastata is found in moist swales at middle elevation. Perennial herb 40 cm - 1.5 m tall Stem: erect, branching above, rough-hairy. Leaves: opposite, stalked, 4 - 18 cm long, more than 2 cm wide, lance-shaped to narrow egg-shaped, gradually tapering to a pointed tip, coarsely toothed or cut, often lobed near base, hairless or rough hairy on both surfaces. Inflorescence: a terminal cluster of many upright, pencil-like spikes less than 7 mm across. Flowers: overlapping on the spike, with lance-awl-shaped bracts often a little shorter than the calyx, a 2.5 - 3 mm long calyx with hairs and awl-shaped lobes, and a hairy bluish purple corolla usually longer than the calyx. Fruit: four linear nutlets surrounded by incurving awl-shaped calyx lobes, each nutlet 1.5 - 2 mm long and smooth to faintly grooved. 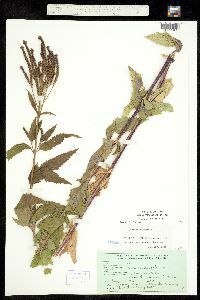 Similar species: Verbena urticifolia and Verbena hastata have more than three flower spikes in a cluster. Verbena urticifolia is distinguished by its egg-shaped leaves and its white flowers that are well separated along the spike. Habitat and ecology: Frequent in marshy areas, moist meadows, wet woods, and wet prairies. Etymology: Verbena is the Latin name for vervain. 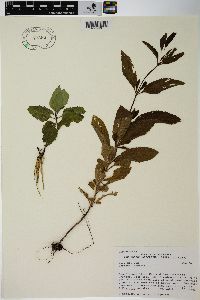 Hastata means spear-shaped. This species is found throughout the state. It prefers a moist soil in the open. It is frequent to common in the lake area in moist places about lakes, in marshes, moist, sandy prairie habitats, interdunal flats, low, open woods, roadside ditches and even in the moist, marl border of a lake. It is less frequent south of the lake area and is found in moist places along roadsides, in clearings, fallow fields and low open woods. I have specimens with white flowers from La Porte and Warrick Counties. Perennial; stems 4-15 dm, branched above, rough-hairy, with short, spreading or antrorse hairs; lvs lanceolate to lance-oblong or lance-ovate, 4-18 cm, gradually acuminate, petiolate, coarsely serrate or incised, often hastately 3-lobed at base, glabrous or strigillose on both sides; spikes strict, usually many in a terminal panicle, short and compact, thicker than in no. 5 [Verbena urticifolia L.]; bracts lance-subulate, commonly a little shorter than the cal; cal 2.5-3 mm, hairy, with ±connivent, shortly subulate-tipped lobes; cor usually blue, the tube somewhat longer than the cal, hairy, the limb 2.5-4.5 mm wide; nutlets linear, 1.5-2 mm, faintly striate or smooth; 2n=14. Moist fields, meadows, prairies, and swamps; N.S. to B.C., s. to Fla. and Ariz. June- Oct. A hybrid with V. simplex is V. آlanchardii Moldenke; one with V. stricta is V. زydbergii Moldenke.